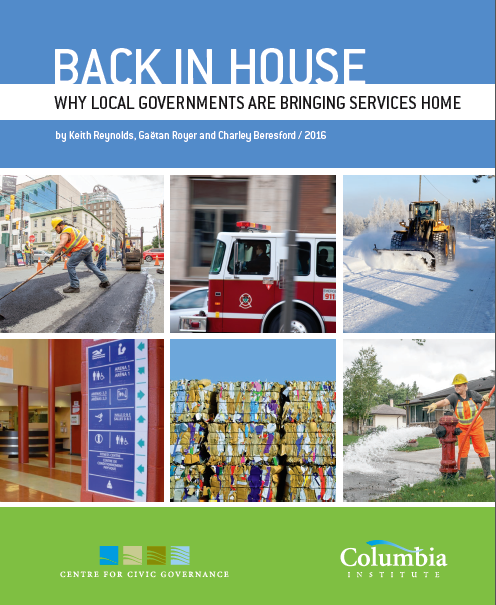 Columbia Institute's Centre for Civic Governance's latest report, "Back in House: Why local governments are bringing services home," says that across Canada and around the world public services that were once outsourced are now finding their way back in-house to municipalities, mainly because using in-house services saves money. Simply put: Privatizing services hasn’t delivered the benefits that were promised. Download English version here; French version ici. Download English Executive Summary here. “Back in House” debunks the myth that it’s cheaper to contract out public services in order to save money and produce a better product,” says Charley Beresford, Executive Director of the Columbia Institute. "In several boroughs of Montreal we've noticed that we've been able to increase productivity, add flexibility to our projects and even improve on quality. Also, for every project we do in-house, and not in the private sector, we reduce chances of collusion and corruption amongst bidders," says Craig Sauve, City Councillor of Montreal.